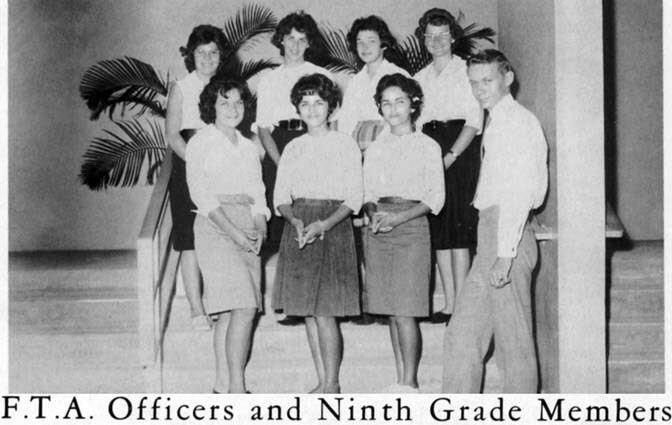 First row: 8th graders Rosalyn Murphy, 2nd from left and her twin sister Marilyn Murphy 3rd from left. Their mother Billie Anne used to take Pete and Eddie Ciolfi, who lived behind them, and me to the Saturday matinees at the Essex Theatre in Hialeah with Rosalyn and Marilyn in a large station wagon. We were only 10 or 11 at the time and we thought they had cooties and they thought we were cretins so it was peaceful. Marilyn Murphy Bullington, 68, of Lee County, GA, died June 1, 2016 at her residence. Funeral services will be held Saturday at 3:00 PM at the First Baptist Church of Leesburg. Dr. Todd Sullens will officiate. Interment will follow in Crown Hill Cemetery. A native of Atlanta, GA, born to the late James and Billie Anne Murphy, Marilyn grew up in Miami, FL, graduated from Hialeah High School, and attended Miami Dade College. Marilyn and her twin sister, Rosalyn, were stewardesses for Eastern Airlines for five years. She moved to Albany, GA from Ft. Lauderdale, FL in 1980. She was the proud owner of Doublegate EE-ZZ Mart for twenty-six years before retiring two years ago. She loved her employees and her customers. Marilyn was a former member of Stonebridge County Club and currently a member of Grand Isle Country Club. She was passionate about horses, riding, training students and showing across the country. She was a member of the Appaloosa Horse Club, American Quarter Horse Association and Dougherty County Saddle Club. She participated in the Atlanta Two Day Walk for Breast Cancer for the past nine years and was a member of The First Baptist Church of Leesburg. She loved hunting, fishing and shopping. Her absolute favorite thing was loving on her daughters, her grandchildren, her great-grandchildren and her husband. Survivors include her husband, Rickey M. Bullington of Lee County, GA, her children, Erin McDonald and her husband, VJ, Heather Hart and her husband, Reed, and Angie Archer and her husband, Todd, all of Lee County, GA and Connie Salter of Gulf Shores, AL, her brothers, James Murphy of Sidney, Australia, Tim Murphy of Ft. Lauderdale, FL, Michael Murphy of Tavernier, FL, and Tommy Murphy of Plantation Key, FL, her sisters, Rosalyn Murphy Hamilton and her husband, Jim of Miami Lakes, FL and Patsy Murphy Winograsky of Craig, CO, her grandchildren, Jordan McDonald of Worth County, GA, Ashley Archer, Blake Archer, Gavin McDonald and Jacob Hart all of Lee County, GA and Ace Salter of Gulf Shores, AL and two great-grandchildren, Griffin McDonald and Arley McDonald. The family will receive friends from 6:00 PM until 8:00 PM Friday at the Bindery at Oakland Library.